It’s the first night of the Summit—a time for mingling, networking and a whole new flavor tripping experience. The EMS Opening Reception is your chance to reconnect with colleagues and meet new industry peers, all while transforming your taste buds with a one-of-a-kind tasting event being brought to you by Marketing Werks. So put on your party shoes and get ready to experience #TrippingAtEMS. What started as the Oscars of event marketing has turned into the industry’s Golden Globes–500 of the world’s best marketers get rowdy as they celebrate the best campaigns of the year. Includes dinner, awards program and after-party. OPTIONAL MORNING YOGA | 6:30-7:25 a.m.
Our Women in Events gets a philanthropic twist this year with the addition of new partner Dress for Success. The agenda features wine and networking amid a fun group interactive in which EMS attendees create hundreds of “career bags”—stuffed with daily work essentials for women looking for jobs in Denver. Come relax with fellow attendees, enjoy a glass of wine, make new connections and reconnect with existing peers. And do it all as we work together in the first-ever EMS “women helping women” activity. Note: Open to registered women. (Any brand marketer interested in donating a product to the career bags should email kelisano@sparksonline.com). The EMS reception is always a who’s-who of event marketing. Reconnect with old colleagues and meet new peeps—grab a cocktail and enjoy great conversations with your industry peers. You’ve never done Denver this way, people. For nearly a decade, leading experiential agency and past Grand Ex winner Motive has created an annual employee escapade called Motive Mayhem. It’s taken the team to Las Vegas, New Orleans, New York, even the heart of the Rocky Mountains. But this time it’s happening in Motive’s hometown of Denver—and you’re invited. For the first time, Motive Mayhem is taking on the Mile High City… and everyone at EMS is on the guest list. Join us for an evening in Denver’s red-hot RiNo (River North Art Direct) district, 1.9 miles from EMS, Motive’s stomping ground and home to the city’s best breweries and bars (all within a four-block walking radius). 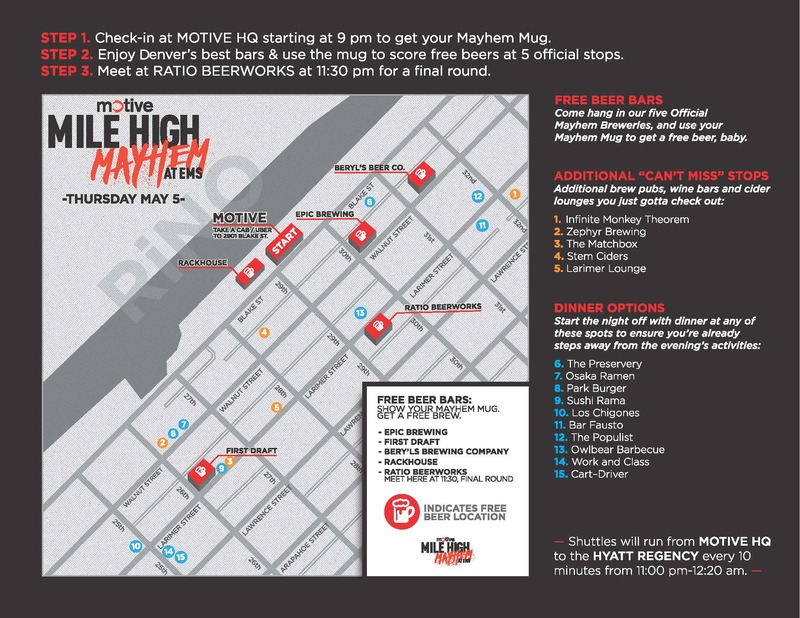 Check-in starting at 9pm at Motive’s RiNo HQ for your signature Mayhem Mug—then use that mug all night to unlock select brews at nearby bars, a few surprise experiences and even a little “Last Call at EMS” action. Have dinner in the RiNo area and you’ll be within striking distance of the evening’s activities, baby. Restaurants right in the heart of the evening’s activities: The Preservery, Osaka Ramen, Park Burger, Sushi Rama, Los Chigones, Bar Fausto, The Populist, Owlbear Barbecue, Work and Class, Cart-Driver. Or if you want to start early, consider dining at the following Mayhem partners that offer full menus: The Rackhouse (closest to Motive) and First Draft. Head to Motive HQ (2901 Blake Street; have your cab or Uber drop you at the intersection of 30th and Blake, entrance to Motive is 50 feet to left of intersection) starting at 9pm to get your Mayhem Mug , a first pour and a map of the evening’s destinations. Grab your mug and hit the streets, sampling some of the best breweries, wine bars and cider lounges this side of the Mississippi. Use your mug for free pours at five Official Mayhem Stops and/or swing by our five just-as-awesome Unofficial Tour Stops. Click HERE for the official Mayhem Map and Schedule. Join us at Ratio Beerworks at 11:30pm for a Last Call with the EMS and Motive crews. Logistics and Transportation: Open to all registered attendees. Get yourself over to the RiNo district (five minutes by cab from EMS) and we’ll get you back to the hotel. Shuttles transporting attendees back to the Hyatt Regency will be running from Ratio Beerworks from 11pm to 12:20am. We highly suggest you have dinner in the RiNo area. Restaurants right in the heart of the evening’s activities: The Preservery, Osaka Ramen, Park Burger, Sushi Rama, Los Chigones, Bar Fausto, The Populist, Owlbear Barbecue, Work and Class, Cart-Driver. Or if you want to start early, consider dining at the following Mayhem partners that offer full menus: The Rackhouse (closest to Motive) and First Draft.